2. The solar energy collected by the absorber is transferred to the water during its journey. 4. Then the heated water returned to the pool. The solar collector shall be positioned facing sun as much as possible for a maximum efficiency.Idealy 30 deg. (above horizontal) facing south/east. Position collector achieve a minimum of 6 hours of direct exposure to the sun every day will optimize performance. Larger systems can compensate in non ideal installations. - Solar Pool Heaters are eco friendly and produce clean energy and will not harm the environment. - Solar Pool Heating Systems can literally double the amount of time you can comfortably use your pool and adds real value to your pool and home. 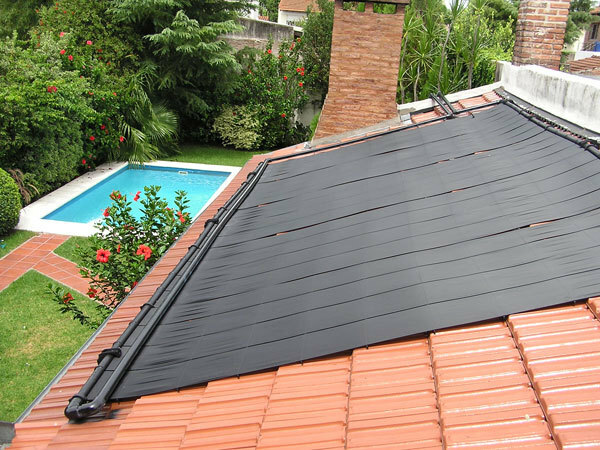 - Solar Pool Heating can pay for itself in a very short period of time, depending on the system used and installation. - Solar Pool Heating Systems reduce your energy usage will give you real dollar savings every day. An average home can expect to save around $300* off their energy bills - year after year. -ary components to install solar collector to your roof,rack or Lawn. (1) 8 pcs of solar panel roll, each length is 3m. 8 pcs of manifold pipe, on top and end side each is 4 pcs. 1.5m in average deepth coverage required. - Ideally Solar Panels should face in a southern position. - Direct sunlight for a minimum of 6 hours every day. - Larger systems can compensate non ideal installations. 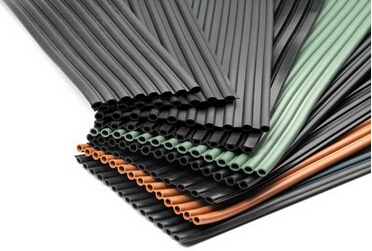 Here are some typical roof plumbing configurations for conventional orientation. Remember to slopeeverything to allow water to drain from the bottom headers of the solar panels as well as the piping on theroof. On sideways installations you don't have to do that. The tubing can freeze solid with water in it andthe air doesn't get trapped in the upper corner like it can on conventionally oriented systems as shownbelow. The roof line is a horizontal line on the roof. In other words tilt everything so the piping andbottom headers will drain by gravity. Co-incidentally that means the top headers will allow air to rise upand out of them naturally. 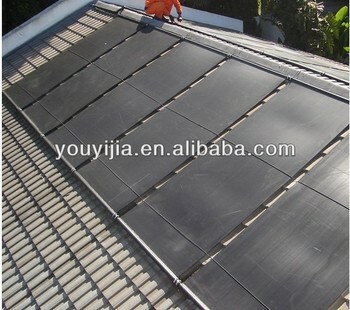 As to solar pool heater mat, the working pressure is 1-2bar will be ok.